Canine bladder stones form when the urinary system is not able to keep the urinary tract free of crystals and infection. The most common cause is bacterial infection. When the urinary tract becomes infected, the bacteria travels up the urethra (the tube which carries urine out of the body) into the bladder. This dog was admitted to the veterinary hospital with hematuria (blood in dog urine), dysuria (difficult or painful dog urination).. X-Ray and ultra-sound examination revealed an enormous canine urinary bladder stone. Infection causes inflammation which restricts the passage of urine. 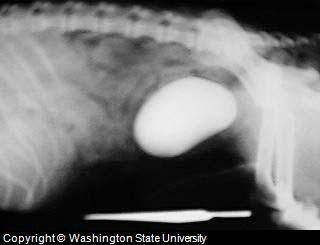 Without proper urination, crystals, the building blocks of dog bladder stones begin to bond together and form stones. Infection itself may not be the cause of the stone formation. Other medical theories include the belief that if the urine doesn't have the proper PH or makeup, stones could form, or if the bladder wall isn't acting properly. In the 1980's researchers determined a link between your dog's diet and stone formation. Diets before the 80's caused the urine to become too acidic, which took away from the urine's stone fighting ability. Because of changes is the way commercial premium dog foods are made, the incidence of one type of stone, struvite has decreased. Stones are seen more often in smaller dogs, than larger dogs because smaller dogs have urine which is more saturated with the crystals that cause stones. There are many types of stones depending on the material that the stone is made out of. The two most common types are struvite or oxalate. The type is important since each may require a different course of treatment. Common symptoms associated with bladder stones in dogs include trouble urinating (another term for this in incontinence). You may notice urination in unacceptable places such as in the home, urine leaking, more frequent urination, less urination, or when your dog does urinate, it doesn't come out with force. If your dog is having trouble urinating, your veterinarian will x-ray the bladder to see if there are any problems such as masses, lesions or stones (calculi). The test is a type of X-ray called a contrast cystogram. The test can also determine the thickness of the bladder wall, another indication of issues. Your vegetarian may also use an ultrasound which uses sound waves to take a picture of the bladder. A urinalysis will also be performed to check for the presence of bacterial infection and the presence of crystals. As mentioned above, diet has a role in helping to control bladder stones. Since diet helps to keep struvite stones from forming (although it is still possible), most dogs have the harder to treat oxalate stones. The first step is to make sure your dog is infection free. Antibiotics are prescribed to help with this problem. Infection also changes the PH of the urine, a problem, that as mentioned, is thought to be a leading cause of the problem (changes the urine from acidic to alkaline). Dietary change can help to dissolve struvite stones naturally. Products such as Hill's Prescription Diet s/d are formulated specifically to help with stones. It isn't as clear why oxalate stones form. Surgery is used to remove the stones if they are large and obstructing (blocking) the urinary tract or causing issues in the bladder. Most veterinarians recommend a change in diet to one that makes the urine more alkaline (reduction of acid). While dietary change may help to dissolve the struvite stones, oxalate stones are more problematic. One diet made for this purpose is Hill's Prescription Diet u/d. Many owners also add a natural supplement to their dog's diet to help restore the PH of the urine to levels that could help prevent stone formation. One product made to support canine bladder health is UTI Free. This company is a good source of additional information on avoiding dog bladder problems naturally. Increasing your dog's water intake can also help since this causes increased urination. Also a switch to canned dog food, which contains 80% more water than dry kibble, can also help to increase the frequency of urination. Don't be concerned that canned foods have more salt. Research has shown that salt actually helps increase water intake without any known side effects in otherwise healthy dogs. When switching from a dry to a moist diet, do so gradually to avoid diarrhea. Start with a small amount of canned food and trade off the same amount of dry. Gradually, switch to greater percentages of canned until your dog is eating 100% canned. If your dog refused to eat canned food then try adding water to the dry kibble. If these simpler steps do not help then your veterinarian may suggest the addition of the medication potassium citrate (Urocit-K®). Another drug that has shown some success in humans is Hydrochlorthiazide. This drug may have gastrointestinal (stomach problems) side effects.